Chinese Medicine is an ancient system of healing that honors the deep connection between human, spirit and earth. It recognizes Five Elements which together create, connect and balance the Whole. 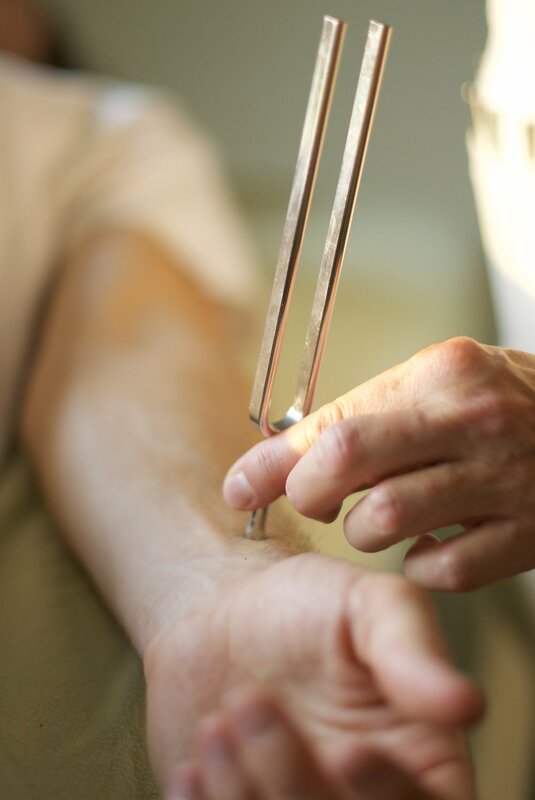 Tama-do Tuning Forks and Colored-Light Wheel are used synergistically on acupuncture points in this unique fusion of Chinese Medicine and Sound Healing. This vibrational therapy touches on all levels of being, from the embodied physical, the emotional and mental to the subtle spiritual. Specific techniques are used to help release the imprints of trauma from the spine, clear and energize the chakra system, and to balance the meridian system, thus bringing the whole person into a state of greater harmony and well-being. Energy Balancing and Amma Massage techniques are used to move stagnated energy and to invigorate areas of deficiency. Space is held for old energetic imprints and constructs to be released, whether physical, emotional or mental in nature. This can allow for movement in previously "stuck" energy patterns, helping the individual to move forward on their healing journey. With tuning forks work, generally the sound keeps actively working in the physical and subtle bodies for about 20 minutes. Then it will continue its work of clearing and harmonizing more subtly in the days that follow. It's important to drink lots of good water after any kind of energy work. Anna Gravina, Certified Massage Therapist, received her training in Chinese Medicine, including Amma Massage and Shiatsu Bodywork, through a 2 year certification program at Elements of Healing in Vermont. Her training in Sound and Color Vibrational Therapy has been with Fabien Maman’s Tama-Do Academy, California. Anna continues her study of the energy systems of people and places with Dr. Patrick MacManaway, internationally renowned geomancer and shamanic healer. Utilizes three revolutionary sound and color healing techniques developed by Tama-do, plus other techniques as appropriate. Session 1: 8 Qi Mo technique combines the 8 Extraordinary Vessels of Traditional Chinese Medicine with Sound and Color applied to the Chakra System. In this session we focus on clearing out from the energy field what no longer serves and strengthening areas of weakness. 75 minutes. Session 2: Musical Spine technique, great for back pain and general detox of the energy system. We tend to hold history in our spines and this is a good opportunity to let some old stuff go. 75 minutes. Session 3: With the Master Shu points technique, we focus on balancing the meridian system and integrating the previous work. 60 minutes. Note: Sessions 1 and 2 can be switched if it makes more sense for your healing process. Starseed Therapeutics is located within Cedarwood Natural Health Center. Cedarwood is a holistic health care center that offers Applied Kinesiology Chiropractic, Nutrition Response Testing, Therapeutic Massage, and more.